This image captures globular cluster NGC 5053. It tends to be ignored by imagers and observers alike, including me until about 2015, because of its surroundings: NGC 5053 lies near a much brighter, richer cluster, M53, and there are some interesting galaxies in the area too. 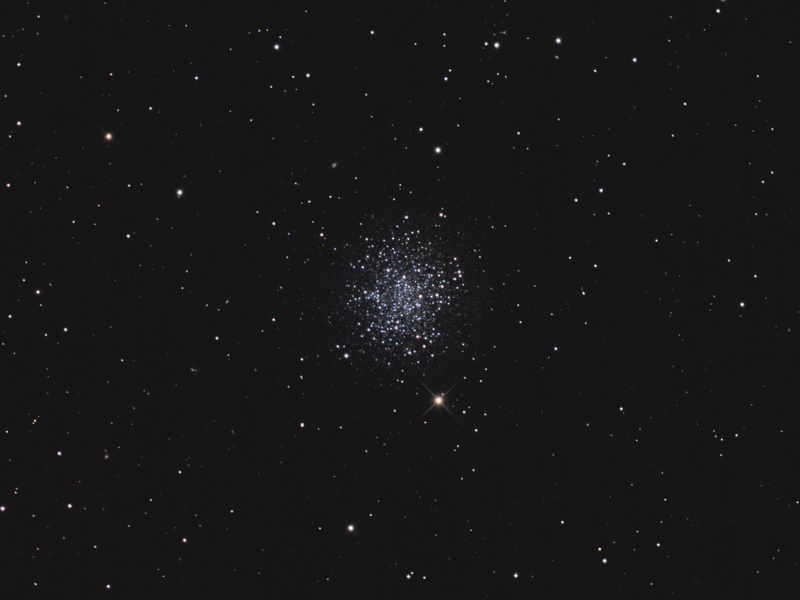 NGC 5053 contains only a few thousand stars, so lacks the dense central condensation of stars seen in most globular clusters, which can contain hundreds of thousands of stars. 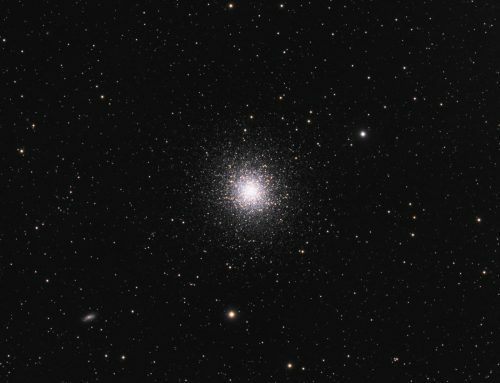 It belongs to Class 11 of the Shapley–Sawyer Concentration Class for describing globular clusters, where Class 12 is the most sparse. 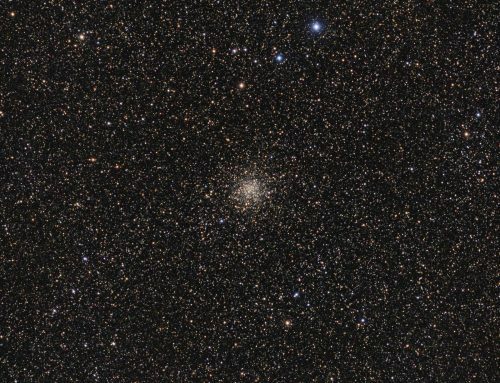 In the eyepiece it looks to me more like an open cluster, but in an image it has the mix of red and blue stars that I see in most globular clusters, and seldom in open clusters. This cluster is about 1/3 the width of the full Moon. Given that it lies 53,500 light years from us, that makes it about 160 light years across. There are quite a few small galaxies scattered throughout the image — look for soft and/or oval “stars” and short spindle-like streaks. A previous version of this image can be found here. The new version shows more stars, a brighter background and more natural-looking star colours. SBIG STL-11000M camera, Baader RGB filters, 10″ f/6.8 ASA astrograph, Paramount MX. Guided with STL-11000’s external guider and 80 mm f/6 Stellar-Vue refractor. Acquisition and guiding with Maxim-DL. Focusing with FocusMax. Automation with CCDCommander. Calibration, cosmetic correction, registration, integration and all processing in PixInsight. Acquired May 6-17, 2015, from my SkyShed in Guelph, Ontario. No moon, good to very good transparency and average seeing throughout acquisition. 14x10m R, 9x10m G and 13x10m B unbinned frames (total=6hr). StarAlignment was used to align all calibrated, cosmetically-corrected frames. ImageIntegration was used to make the R, G and B masters. DynamicCrop was used to crop all the masters identically. DynamicBackgroundExtraction was applied to each master twice, first with Division and then with Subtraction. Deconvolution: A star mask was made to use as a Local Deringing Support Image. A copy of the image was stretched to use as a deconvolution mask. Deconvolution was applied (80 iterations, regularized Richardson-Lucy, external PSF made using the PSFImage script; Global dark deringing = 0.03). Linear Noise Reduction: MultiscaleLinearTransform was used to reduce noise in the background areas, using an internal mask to protect bright structures. Layer settings for threshold and strength: Layer 1: 3.0 0.8 Layer 2: 2.5, 0.7 Layer 3: 2, 0.45 Layer 4: 1.0, 0.1. Nonlinear Noise Reduction: SCNR was applied with a strength of 0.53. TGVDenoise was applied in L*a*b* mode to reduce noise in the background. Sharpening: MultiscaleLinearTransform was used to sharpen Layers 2 and 3 with strengths of 0.15 and 0.11, respectively. A mask was used to select only the core of the globular clusterfor sharpening. Final Steps: Brightness, contrast and saturation were adjusted in several iterations using CurvesTransformation with various masks as required. 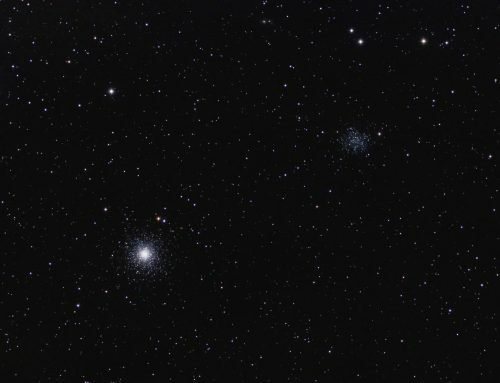 Background, cluster and non-cluster stars were adjusted separately. I like high magnitude DSOs with no bright neighbors inside the frame of pic , so it looks so serene !! Have you looked at N7762 which is mag 10 with lots of stars.. I haven’t imaged NGC 7662 yet. Note that it is an open cluster. 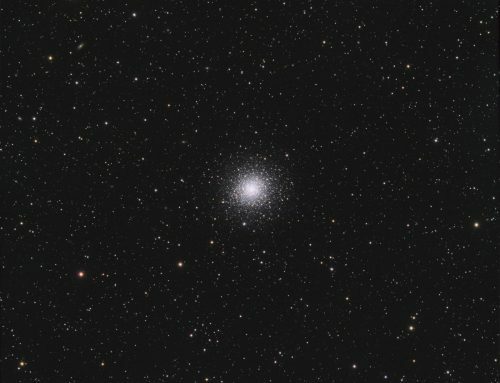 Ngc 5053 is a globular cluster. It is so refreshing to see a closeup of this! Don’t forget about NGC 4147!